The consistency of training is ciritical to what we do as we aren't using masks or additional protection beyond a set of gloves. Additionally, the vast majority of our demonstration work is done 'a tiempo' or 'at time'. Basically, at a slower speed but without any pre rehearsed choreography. We mainly train with the rapier and its accompanying weapons, and have expanded our program to include other weapons, such as the broadsword, backsword, longsword, and quarterstaff . Bankeside is unique in that we pattern our training curriculum after the existing manuals remaining from the period. Each student must therefore research historical methodology as well as apply the knowledge practically. Our training system is unique in that we consider rapier fighting to be a true western martial art. We train using the original Italian terminology (This has the added advantage of being theatrically sound as well). Our curriculum includes drills and maneuvers, practiced in groups and individually, that focus on specific actions (cuts, parries, etc. ), choreography, and routines. An example of a popular drill is "A Tiempo", which means 'in time'. This exercise is done in pairs and is used to test the effectiveness of cuts and parries. Because this exercise is not choreographed, it is done a one-quarter speed for safety. We do not use armor and take great pains to ensure safe practice and proper handling. 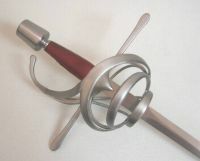 Each student must therefore pass a "Scholars Routine", which is designed to demonstrate competence with the rapier before the student is allowed to begin learning choreographed fights or to fight at faire. Students carry the knowledge that swordfighting is a privilege, not a right. Additionally, Bankeside is unique in our choice of rapiers. Most other schools train using modern fencing foils, epees, and sabers, which have the advantage of being both very lightweight and maneuverable, but lack the true weight and heft of true period weapons. Bankeside students prefer to use Schlager and 'transitional' blades, which enable 'live steel' combat and give an increased level of endurance to the practice due to their additional weight. If you're interested in additional information on training please contact Steven Leon through the contact page. The Rapier - The first weapon we teach here at Bankeside. This weapon was used on the field of honor to settle disputes between gentlemen in the 16th and 17th centuries. The blades range in size of 37 to 41 inches and some surviving historical examples can be found in upwards to five or six feet in length. The use of this weapon was primarily to thrust, though most had an edge to create cuts. As a result, this weapon was completely useless on the battlefield suited more for duelling. Frequently, this weapon was decorated when made making this sword not only a deadly weapon in the hands of an expert, but a mark of distinction for the renaissance gentleman. 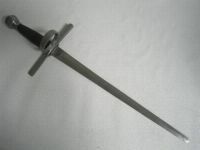 Parrying Dagger - A 12 to 18 inch long secondary weapon used in conjunction with the rapier. Called by the French as the "Main Gauche" (literally meaning left hand), this companion was used as a means of defense, putting aside your opponents blade. However, can be used as a secondary means of offense as well if close enough to your opponent. Buckler - Another companion to the sword, the buckler was a small, easily manuverable shield meant to knock or beat aside an opposing blade. 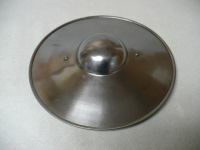 Generally ranging in size from between nine and 18 inches, this metal shield can be used to 'punch' the arm or the face of your opponent. Broad and Backsword - A military style weapon used on the battlefields of Europe for centuries. These types of weapons were wielded one handed and are often referred to as 'short swords'. A broad sword had two edged while a backsword had only one making the backsword a favored weapon of mounted forces since the triangular cross section made it easier to hew through your opponent. 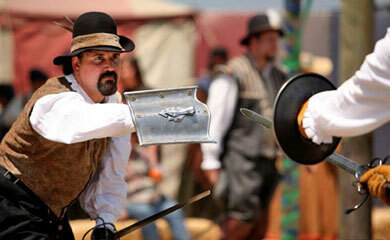 Eventually, basket hilts were designed by the English in 1580 which enabled the hand to resist most hits. This style of hilt was used well into the 18th and 19th centuries. Quarterstaff - A hardwood pole of length ranging from seven and nine feet in length. Quarterstaffing was done with the staff held at the last quarter of the weapon. This gave the advantage of keeping your opponent at a distance as well as the ability to deliver crippling or fatal blows to your adversary.